What's the Buzz? 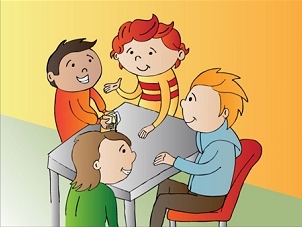 - Why teach social thinking or social skills? Why teach social thinking or social skills? "I honestly don't know how people can exist without friendship; people share their secrets, hopes, humiliations, losses and dreams. Friendshipis wonderfully serendipitous. It need have nothing to do with coming from the same place, background or interests. A friendship can grow on the most unlikely and barren ground." For most, social thinking is hard-wired at birth and this sets the stage for rich development over a lifetime of social interactions. We quickly learn the consequence of thinking and behaving pro-socially. We understand that every social encounter is shaped by how we speak, share, take turns, gesture, discuss, use space, stand, walk, develop friendships, cope with disappointment and boredom, even how we relate to a pet, a movie or a story. As our social thinking develops we begin to integrate the thoughts, feelings and intent of others as a vital part of our world. For a variety of reasons some children find it harder to think socially and use their social tools suitably when it really counts. Yet, collective research tells us that children, who can engage with peers, can attach to them, and feel as though they have healthy relationships have a much greater chance of happiness and wellbeing as they grow. By the time children reach adolescence the longing to fit in and interact often intensifies (Church, et al, 2003). Clinical studies point out that is, without adequate social success children and adolescents are more likely to be at risk from emotional and mental health difficulties (Hay, Payne and Chadwick 2004). The ability to create and foster friendship, accompanied by opportunities to feel accepted by others, is very significant. Without explicitly teaching children how-to successfully connect, and work with differences, we run the risk of some becoming discouraged, or worse. Sadly, when young human beings can’t find a way to belong to peers a ‘faulty logic’ clicks in allowing them to believe that what they’re doing is working, even though it is not - their thinking becomes stuck! Teaching social and emotional literacy with the same vigour we’ve traditionally taught academic skills increases a young person’s confidence and competence to get along with others, and embrace life. Social and Emotional Learning programs also positively influenced the overall academic engagement and performance of students (www.casel.org). Professor John Hattie, in his ground-breaking book 'Visible Learning' provided educators with state-of-the-art evidence about the greatest influences on student learning and engagement. With respect to social skills programs he states, "Social skills programs can make a positive difference to social outcomes" (Hattie, 2009, p.150). His evidence, based on 84 studies and 27,064 students, indicates that the most effective programs employ coaching, direct modelling, obvious feedback and focus particularly on individual peer relation issues. 1. Social observation (social referencing) is when a person pays attention to what’s happening around them, and then tries to 'fit' their behaviour to match that context. Social thinking involves how the social and emotional behaviour of others is interpreted. A child able to use flexible and resilient social cognition can ‘read between the lines.’ They can accurately work out whether the event was intentional or accidental, when someone is serious or being playful and when someone is being genuine or underhanded. Social action involves more than understanding what should be done. It combines the confidence (the how to) to actually carry out pro-social behaviour when required. The programme offers multiple opportunities for children to understand and practice social skills. Church, K., Gottschalk, C.M., Leddy, J., 2003, 'Enhance social and friendship skills', Journal of Intervention in School and Clinic 38 (5), 307-310. Hattie, J., 2009, Visible learning: a synthesis of over 800 meta-analyses relating to achievement, Routledge, New York. Hay, D., Payne, A. and Chadwick A. (2004) 'Peer relations in childhood.' Journal of Child Psychology and Psychiatry 45, 84-108. Payten, J., Weisberg, R., Derlak, J., Dyminicki, A., Taylor, R.D., Shellinger , K.M., Pachan M., 2009, 'The positive impact for social and emotional learning for kindergarten to eighth grade students: Findings from three scientific reviews', Executive Summary by Collaborative for academic, social and emotional learning.